As the world’s technology improves, so do the opportunities created for people with disabilities. Considering how important the internet is becoming to the world, it is no surprise that there are many options for computer users who are visually impaired or blind. Braille keyboards, screen reading software, and magnification systems are all technologies that allow people who are visually impaired or blind to use the internet as easily as a person who is fully sighted. Though this technology is an amazing resource for people with vision loss, the Canadian National Institute for the Blind (CNIB) says that many children who are blind or visually impaired are now being taught to rely more and more on voice synthesizers to communicate. Voice synthesizers are programs or devices that read the text on a screen aloud to their user. This allows people who are blind or visually impaired to read their email, Facebook, and Twitter with ease. This technology can also take spoken words and convert them into on-screen text. That way, someone can speak into a microphone, and the words will be typed out without the use of a keyboard. CNIB provides support and information to blind or partially-sighted people in Canada and helps them find products and activities tailored to their needs. According to CNIB, by depending exclusively on voice-synthesizing softwares, key abilities like grammar, punctuation, and general braille understanding are being forgotten. Braille, a writing system published in 1829 by Louis Braille, is read by touch instead of sight by using raised dots in a paper or display that can be felt by the fingers of the user. Just like non-braille language, braille has punctuation, numbers, and contractions. Studies cited by CNIB have shown that employers are more likely to hire a person with vision loss who is proficient in braille instead of people who have been taught to rely solely on technological means of communication. Braille is also used more often in day-to-day life as compared to computer-only resources. Labels, board games, and notes, among other things, are more easily written and read using braille. 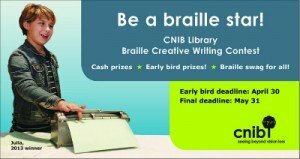 Keeping this in mind, one service provided by CNIB is the Braille Creative Writing Contest. This contest is available to blind or visually impaired children up to Grade 12 and promotes CNIB’s belief that braille is an important skill for these children to have. It encourages young authors who know braille to use it in writing stories, essays, or poetry. In 2013, children from across Canada were awarded prizes for their amazing braille entries. These works, which are transcribed into text on the CNIB website, range in topics and writing ability. Four of the finalists were even given the chance to travel to Toronto to accept their awards in person! This contest is currently open to Canadian-only submissions and must be postmarked no later than May 31, 2014. The entries will be judged on braille and creativity skills in four separate age categories: Grades K-2, 3-5, 6-8, and 9-12. Cash prizes ranging from $25-200 are being handed out to first, second, and third place writers. It is worth checking out for any Canadian jaBlog! readers who are blind or visually impaired and love to write! Wow, that’s really interesting! I’ve always been curious about Braille since I learnt about it in primary school, and it’s brilliant that there are competitions for people who have visual impairments. Awesome! Deadline is May 31 and winners will be announced in September!